The dungeonmaster from I Hit It with My Axe wrote an RPG supplement about how to run the city of Vornheim, and make up your own fantasy city. In the two separate campaigns of D&D that I've been running in The Escapist offices over the last six months or so during lunch, I've focused a lot on rolling randomly to see what's around the next corner. I have tables and random encounters galore, and it's been fun for both me and my players to see what comes with a roll of the d20. Zak Sabbath has taken that to the extreme with his supplement called Vornheim: The Complete City Kit by providing not only the background for the city he used in the campaign of I Hit It with My Axe but the tools needed to create vibrant cities on the fly. "This book is not about Vornheim, it's about running Vornheim - or any other city - in a fantastic Medieval setting. 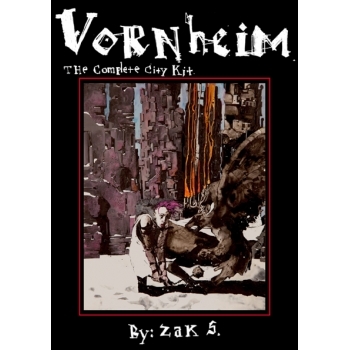 And about running it with a minimum of hassle - so you and your players can get to the good stuff," Zak Sabbath says in the introduction to Vornheim: The Complete City Kit. The supplement is currently available to pre-order in PDF form from the Lamentations of the Flame Princess website. The PDF is 12.50 Euros right now, but a real brick and mortar book is planned eventually. I've already put down my order to help me out with my 4th Edition games, what are you waiting for?